Smoked shrimp spring rolls - There was nothing bad about them, just nothing extraordinary. 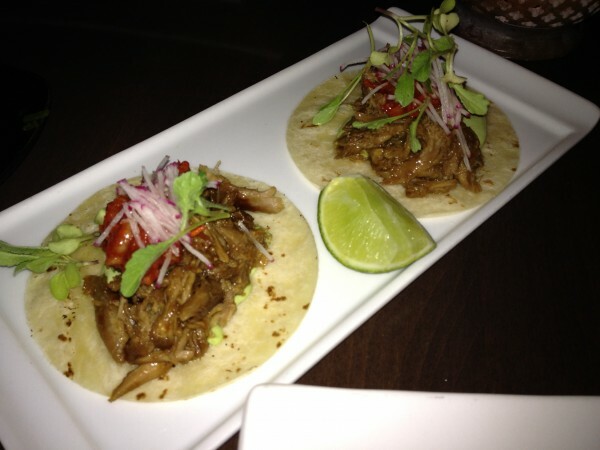 Duck tacos – duck confit, kimchi and radish in small flour tortillas. Each were 2 bites of tasty duck deliciousness. Humita (a charred corn tamale) – I don’t really understand tamales, that said, I really liked the depth of smoky flavor and the bacon didn’t hurt either. Pork belly ramen – I think this was Marc’s least favorite dish, but I thought it was good, but the broth could have been richer. Lobster bowl – flat noodles, lobster, bacon, parmesan, peas and cream. Does this sound Chinese/Peruvian or Italian to you? It looked like a carbonara to me, but a damn tasty one, so who cares? Mussels in a coconut rum broth – Tender mussels, flavorful broth: I was happy. 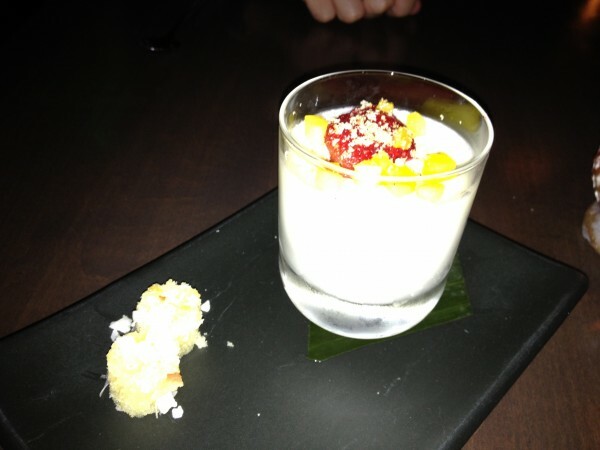 Coconut panna cotta – Now, this was served in a glass, which is completely wrong. How am I supposed to check for the appropriate jiggle? But, it was very creamy, silky and the toasted coconut flavor was outstanding. My favorite dish of the night was actually the complimentary pupusas with the spicy guava spread. Warm, cheesy, sweet and spicy: awesome. The tables to the left and right of us got the Chinese 5-spiced pork entree and it looked amazing. I wish we thought to order it. Many people consider Vetri one of the best Italian restaurants in the country, and I would have loved to go, but they only offer a Chef’s Tasting menu and that’s less than optimal for Steve. 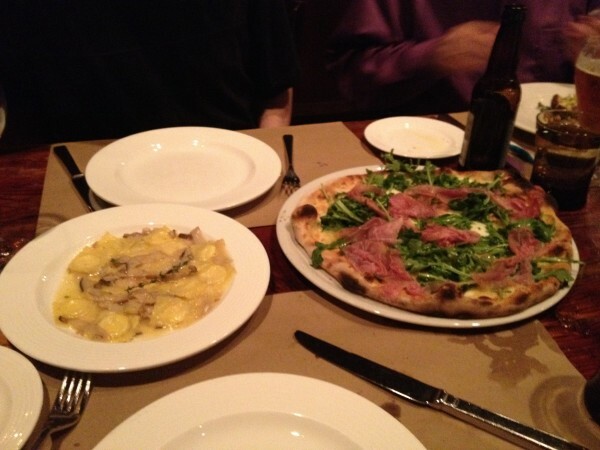 Instead, I opted for Marc Vetri’s more casual concept, Osteria and we were joined by our friends Kim and Robin. 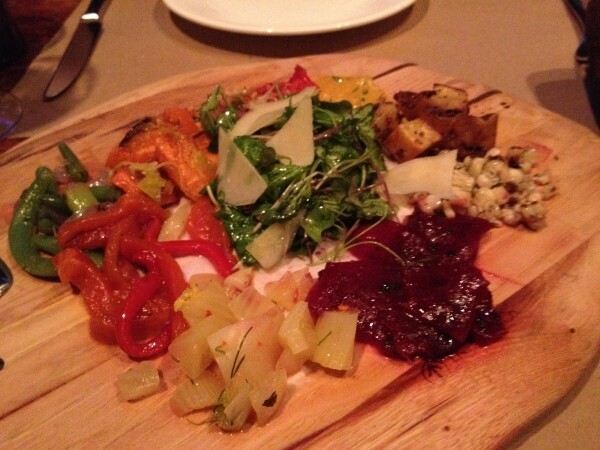 We started with the special vegetable antipasto. It was served on a wooden board with no less then ten different vegetable preparations: roasted beets, marinated peppers, sautéed eggplants, braised leeks, just to name a few. I thought it was a wonderful appetizer and great for sharing. Steve and I split the robiola francobolli - “postage stamp” ravioli filled with rich, soft robiola cheese served with trumpet mushrooms and thyme. Steve thought it was “too rich,” that was fine with me, because I thought the pasta was outstanding and happily ate more than my share. Next was a “Parma” pizza, which was also quite good. It was topped with mozzarella, fontina, arugula, and prosciutto di parma. The crust was well cooked and flavorful. 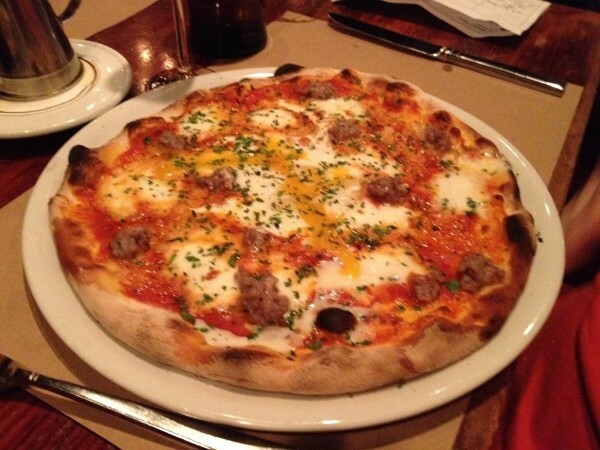 Kim’s pizza, lombarda (baked egg, bitto cheese, mozzarella, and cotechino sausage) had some great flavors, but the egg was under cooked. I love a runny yolk, but when the whites are still slimy, it’s underdone, even for me. Robin was the only one to get an entrée; I thought there was nothing special about this pork tenderloin. We shared a sampling of their desserts: cherry schiacciatta with bitter chocolate sorbetto, chocolate flan with pistachio gelato, polenta budino with hazelnut, and coconut gelato. I thought the cherry schiacciatta was the most interesting; it was almost like a sweet focaccia, dimpled with sweet cherries. 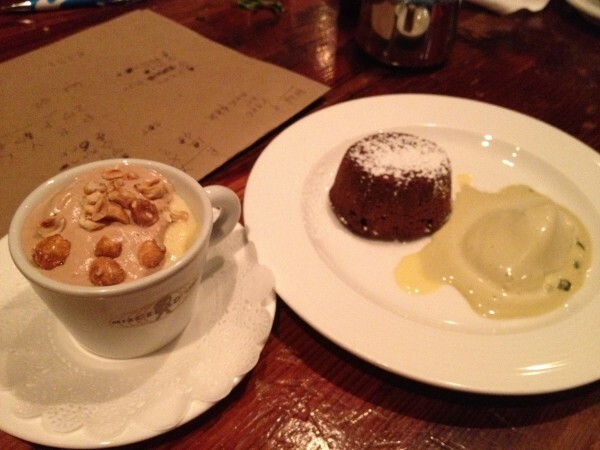 My budino was similar to an Indian pudding, a warm cornmeal pudding, but with hazelnut flair. When Kim ordered the flan, she was warned that it was not like a traditional flan, but more of a molten chocolate cake. It was an apt description, so I ask you, why not just call it a molten chocolate cake? Steve’s coconut gelato had a deep, toasted coconut flavor, but suffered from the same fate as the other frozen accompaniments that the table; it was too warm and half melted. The service was excellent, as was the bread basket and the cocktails were delicious. I think that if you don’t want to dish out $135 ($155 as of Spetember) for Vetri, Osteria is a great option.